These free printable birthday cards feature a tiny party-dressed mouse on top of a yummy, beautiful cake with a cherry on top. 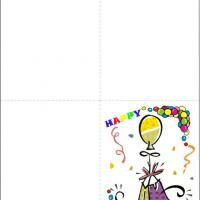 It also includes other birthday elements such as a party hat and bright colors which makes this birthday card suited for young celebrants. These printable birthday cards are also ideal for older birthday celebrants who enjoy a dash of the sweet and cute to their special day. Print this in a hard paper then fold it in half. Do not forget to include your message inside! This little mouse is ready to party and that cake won't eat itself. 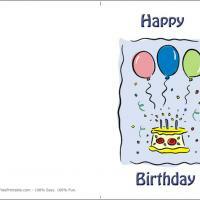 Mouse on Top of Yummy Cake card is one of many fun cards from these free printable birthday cards. This wee tiny little mouse has arrived just in time for a teensy little cake dance to wish someone a sweet happy birthday. 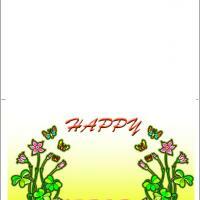 This fanciful card will delight the younger kids or adults who enjoy the whimsy of tiny creatures. She is dressed in an adorable pink with white polka-dot party dress. The cake is a sweet confection topped with pink icing and a cherry on top. 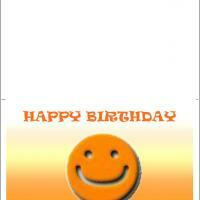 And, with a click or two text or clip art can easily be added before you print these cards at home. You will love our custom print feature to include those personal words you so want to share to let them know you care. It will only take a few easy steps. Mouse on Top of Yummy cake is delightfully decorated with pinks and blues. The delicious looking cake has two layers with pink icing and presented on a light blue serving platter. The tiny little mouse has shown up in her best little polka-dotted party dress. Inside the happy birthday greeting is printed in a bright pink block letters surrounded by a party hat and another birthday cake with candles lit on top.